7.1 The trustees of a Recognized Provident Fund, or any person authorized by the regulations of the Fund to make payment of accumulated balances due to employees, shall in cases where sub-rule(1) of rule 9 of Part A of the Fourth Schedule to the Act applies, at the time when the accumulated balance due to an employee is paid, make therefrom the deduction specified in Rule 10 of Part A of the Fourth Schedule to the Act. The accumulated balance is treated as income chargeable under the head "Salaries". 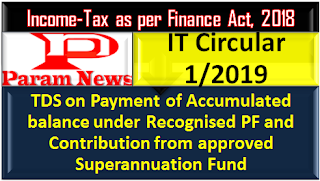 7.2 Where any contribution made by an employer, including interest on such contributions, if any, in an approved Superannuation Fund is paid to the employee, tax on the amount so paid shall be deducted by the trustees of the Fund to the extent provided in Rule 6 of Part B of the Fourth Schedule to the Act. TDS should be at the average rate of tax at which, the employee was liable to be taxed during the preceding three years or during the period, if that period is less than three years, when he was member of the fund. The deductor shall remain liable to deduct tax on any sum paid on account of returned contributions (including interest, if any) even if a fund or part of a fund ceases to be an approved Superannuation fund. 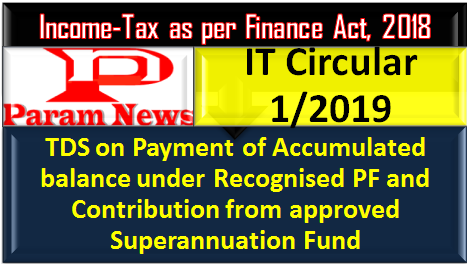 7.3 As per section 192A of the Act, w. e. f. 01.06.2015 the trustees of the EPF Scheme 1952 framed under section 5 of the EPF &Misc. Provisions Act, 1952 or any person authorized under the scheme to make payment of accumulated balance due to employees, shall, in a case where the accumulated balance due to an employee participating in a recognized provident fund is includible in his total income owing to the provisions of Rule 8 of Part A of Fourth Schedule not being applicable at the time of payment of accumulated balance due to the employee, deduct income tax thereon @ 10% if the amount of such payment or aggregate of such payment exceeds Rs 50,000/-. In case the employee does not provide his/her PAN or provides an invalid PAN then the deduction will have to be made at maximum marginal rate. (iv) if the entire balance standing to the credit of employee is transferred to his account under a pension scheme referred to in section 80 CCD and notified by the central Government. When the accumulated balance due and becoming payable to an employee includes any amount transferred from his individual account in any other recognized provident fund(s) maintained by his former employer(s), then in computing the period of continuous service the period or periods of continuous services rendered under former employer(s) shall be counted for the purposes of (i) and (ii) above. Under the above four situations at (i) to (iv), the accumulated balance due and payable to the employee is not liable for TDS under section 192 A.